There are some that stick out, as noted above, but none probably more so to the current generation that Mr. Walker. 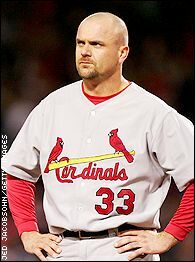 Traded to the Redbirds for three prospects that never did much, Walker was a wonderful complementary piece to the great teams of 2004 and 2005. Sliding into the second spot in front of Albert Pujols, Walker hit 11 home runs in his 44 games in 2004, then had another solid year in 2005 before hanging up the cleats, becoming one of a large number of veterans who come to St. Louis late and never go anywhere else. “I have never heard so many people say so many good things about an organization as I have about the Cardinals,” Walker said at the time of the trade. He was cheered before his first at-bat, then got another standing ovation after he struck out, something that doesn’t happen often. Then again, it’s not often you have a legend of the game join you for a late run at a shot at a ring. Walker’s exploits in Montreal and Colorado had made him an icon of the game and, perhaps, one day will see him in Cooperstown. This picture seemed perfect, though. Like us, Walker is perturbed we don’t have baseball yet. Bring it on!